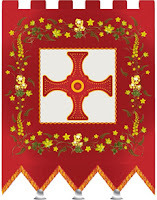 Banner of St. C: Where's the cudgel? Good ol' Cuddy was probably ~53 years old when he died of an unspecified illness in his hermitage in Northumbria. He began his monastic career only after serving in a war against the King of Mercia. After the war, Cuthbert arrived at the monastery of Melrose bearing a spear, not a cudgel. In 664 he was named prior of the monastery at Lindisfarne which would later bear his name. Though he ultimately returned to Lindisfarne as Bishop, he spent much of the last decade or so of his life living as a hermit--not unlike a certain mad man in the environs of the Keep on the Borderlands. His monastery would gain fame in 793 for being the first known location in the British Isles to be raided by Vikings. Whether this event inspired the sacking of the monastery in the Sample Dungeon of the AD&D Dungeon Masters Guide cannot be known for certain. St. Cuthbert's Gospel, based on the Codex of Grandior, is the oldest extant example of a "western binding." Awesome, right? There are two caves in northeast England that bear his name. Possibly they are named such because his sanctified remains were hidden in one or both of them to keep them safe from the Danes who continued to ravage the area for centuries. Cuthbert's aforementioned gospel was also stashed in his coffin for safekeeping. On a somewhat creepier note, so was the head of poor St. Oswald. Once, after praying in the ocean, otters breathed on St. Cuthbert's cold feet to warm them up. Two more Cuthberts were later canonized but, as is often the case, the sequels were not as cool as the original. The Cuddy Duck is a species of waterfowl found in the vicinity of Lindisfarne. The "Liberty of St. Cuthbert's Lands" was a political entity in Northumberland that operated as a sovereign entity--a Palatinate--run by the Bishops of the vicinity. According to Wikipedia, the people here were known as the haliwerfolc, meaning, rather literally, "holy man people", and it was believed that St. Cuthbert was "fiercely protective of his domain." Inspiration for the See of Veluna? An eagle once brought him some fish n' chips, which he shared with the eagle. The Venerable Bede, a saint himself, wrote two hagiographies of Cuthbert. Bede failed to mention Cuddy's affinity for hats in either tome. St. Cuthbert's horse once interrupted his prayers to point out a delicious packet of bread and cheese stashed in a nearby roof. Animals, apparently, couldn't help but give ol' Cuddy a hand. It might just be a coincidence that the hermit in B2 K. on the B'lands had a protective pet puma. Welsh Anglicans prefer to celebrate his feast day on Sept 4 while Episcopalians in The States pay their respects to ol' Cuddy on August 31. Y'dey, Canoness of Hommlet, took it a step further instituting a 5 day celebration that spanned both dates. Damn--poor lady lived to be ~100 and then got eaten by a giant beetle. Remember the scarab/beetle in the basement of the inn in T1? I got that beetles are important to decomposition, just as fungi are.